I now provide sales information for the last three months of the current and prior year, e.g., August - October 2010 and 2011. 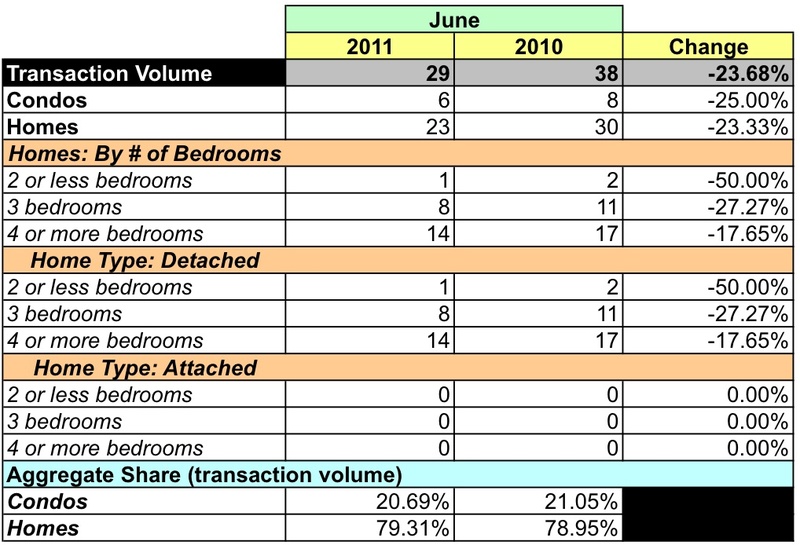 Some readers didn't think data for one month provided sufficient insight into sales trends in a given zip code. Some folks had a problem with 2011 being the left-most column so to appease them I moved it to the right. Finally, I've combined the data into one table. Frankly, that makes my job easier. I'll probably be adjusting the table over the next few weeks. Your suggestions for improvements are welcomed. Total unit sales were 9.62% lower. The average price for a home fell 22.9% and the median price was 16.21% lower. 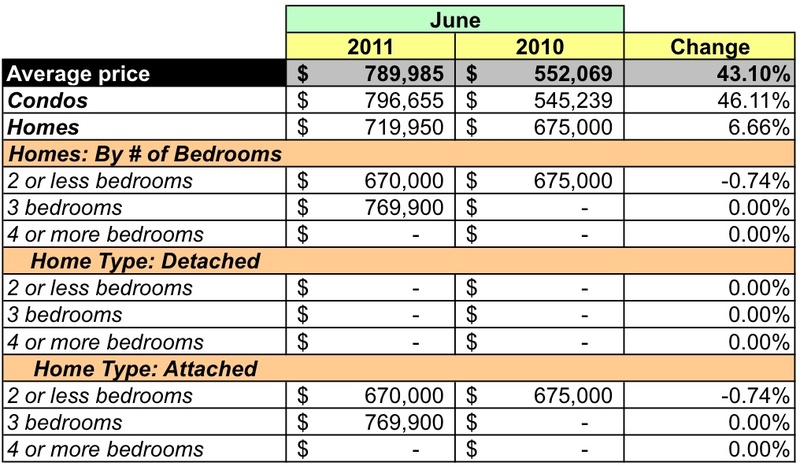 Eight houses were sold for an average price of $796,125, down 16.8%. Thirty-nine condos were sold for an average price of $402,850, down 11.44%. 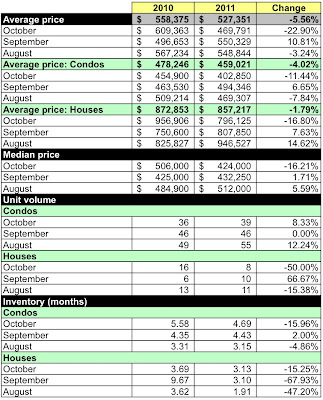 There were 208 active listings during October: 183 condos and 25 houses. 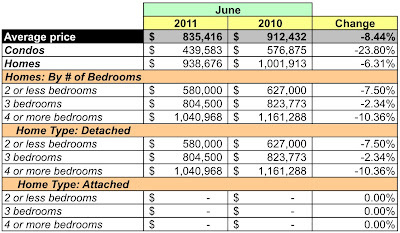 More than half of the condos listed were priced $200-499K and most of the houses were listed at $500K or higher. According to MRIS, properties in 20009 sold for 94.8% of the listing price, a slight dip from October 2010. 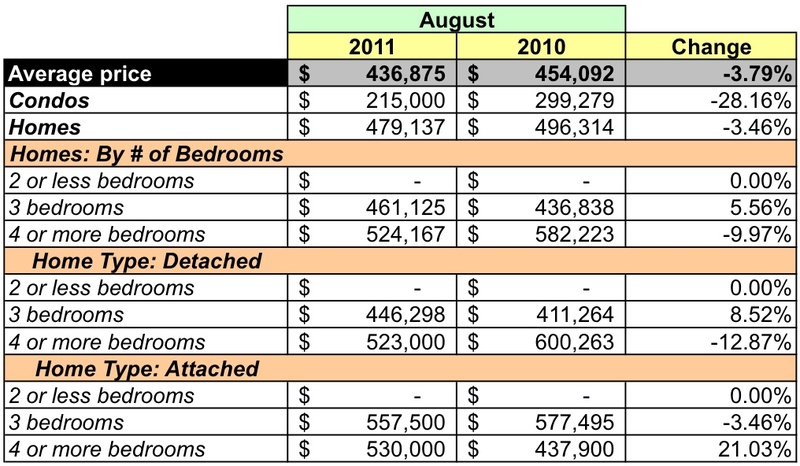 At October's sales rate, there's a 4.69 months supply of condos and a 3.13 months supply of houses. In fact, inventory has been tight for the past three months for condos and houses. Overall, homes are selling quickly in 20009 - the average days on market fell to 62 days, down almost 13% from October 2010. Looking ahead, 48 homes went under contract in October and another 45 went under a contingent contract. Based on the sales data, 20009 is a seller's market. 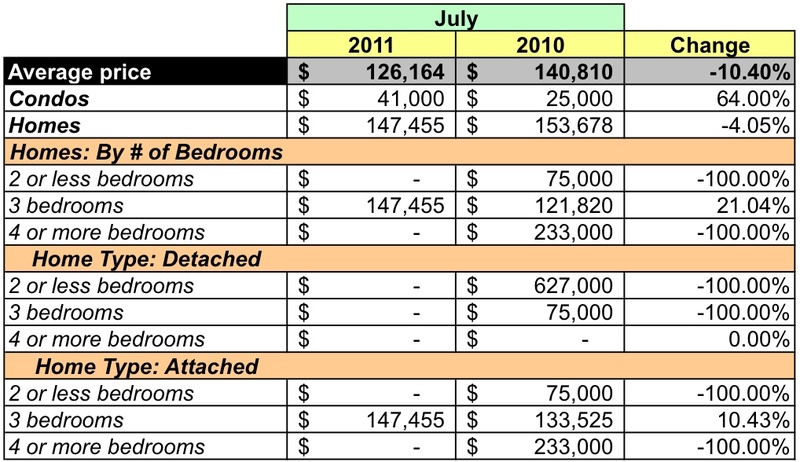 Properties appear to move quickly, but there appears to be some wiggle room on prices. The good news for condo buyers is that prices are relatively affordable [for DC] and supply is high enough to offer choices. And now, on to August. Today I analyze August's sales for zip code 20910 using data provided by MRIS and RBI. 20910 is home to Silver Spring, MD. It's roughly bordered by the District on the south, Sligo Creek on the east, I-495 on the north, and Rock Creek Park / Grubb Road on the west. Aggregate dollar volume was down 14.1% over the same month in 2010. Unit sales were 10.71% lower. The average price for a home fell 3.79%, but the median price was up 5.22%. 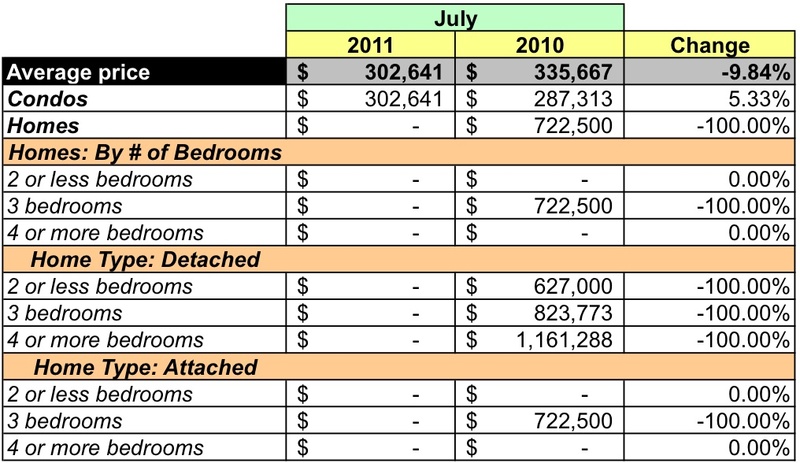 Twenty-one houses were sold for an average price of $479,137, down 3.46%. 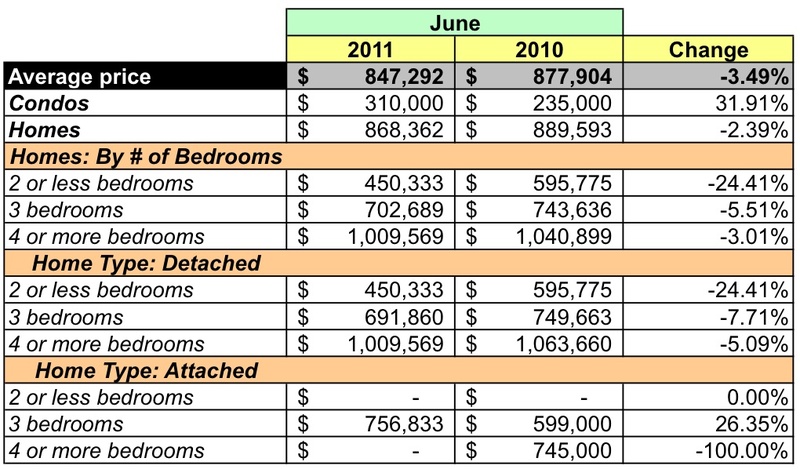 Four condos were sold for an average price of $215,000, down 28.16%. Of the twenty-five homes sold, four were sold through a bank-mediated sale at a median price of $285,000. For the past twelve months, the average monthly sales volume has been 14 detached houses, 2 townhouses, and 7 condos sold per month. There were 85 active listings during August: 26 condos and 59 houses. More than half of the condos listed were priced $200-299K and more than half the houses were listed in the $400-600K price range. According to MRIS, properties in 20910 sold for 95% of the listing price. At August's sales rate, there's a 6.5 months supply of condos and a 2.8 months supply of houses. Overall, homes are selling quickly in 20910 - the average days on market fell to 69 days, down almost 30% from August 2010. However, the condo market has tipped slightly in favor of buyers. 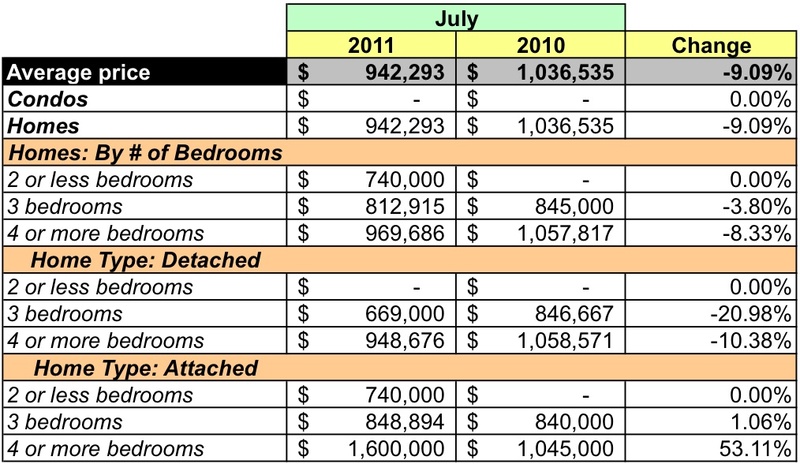 Looking ahead, 24 homes went under contract in August and another 21 went under a contingent contract. Today I analyze July's sales for zip code 22101 using data provided by MRIS and RBI. 22101 is bordered by the Potomac River, I-495, 267, and Kirby Road. We'd tell you it's home to the CIA, but we can't. But we can tell you it's home to McLean, VA. Aggregate dollar volume was down 15.91% over the same month in 2010. Unit sales were 7.5% lower. 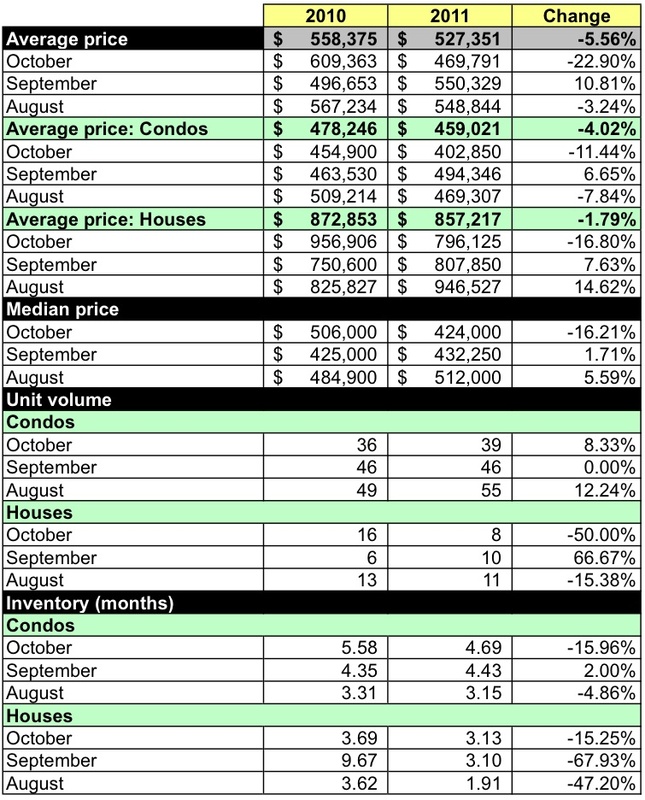 The average price for a home fell 9.09% and the median price was down 7.81%. No condos were sold. 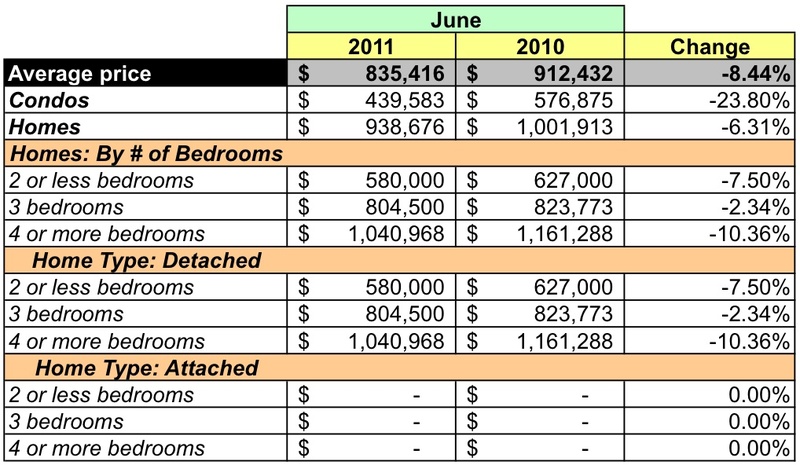 Thirty-seven houses were sold for an average price of $942,293, down 9.09%. The houses sold in 22101 are large - 31 of 37 houses sold had 4 or more bedrooms. 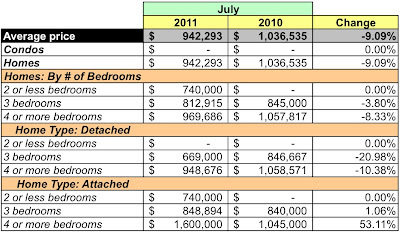 Those large houses experienced a 10.38% drop in average price in July 2011. 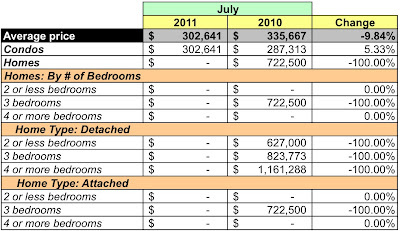 For the past twelve months, detached housing has dominated sales in 22101. The average monthly sales volume has been 26 detached houses, 3 townhouses, and 1 condo sold per month. There were 165 active listings during July, 8 condos and 157 houses. 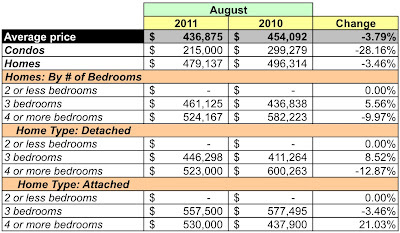 The list prices for condos topped out at $2.5M, but half were in the $200-300K price range. 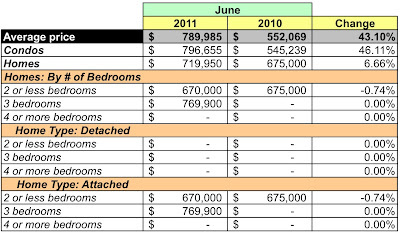 Generally, house prices were in the $500K-infinity price range, with almost half in the $1-2.5M price range. 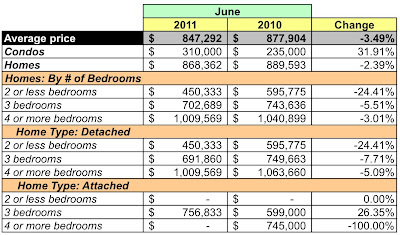 According to MRIS, properties in 22101 sold for 95.2% of the listing price, almost flat compared to 2010. 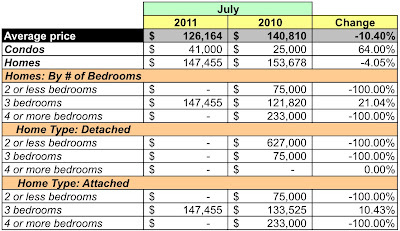 At July's sales rate, there's a 4.24 months supply of houses and they're selling fast - average days on market fell by a third from July 2010 to 61 days. Looking ahead, 23 homes went under contract in July and another 30 went under a contingent contract.